It was our PERFECT DAY in the most PERFECT & BEAUTIFUL LOCATION. We stuck gold when we found the stunning Cosawes Barton to hold our wedding. It truly is the perfect place for a romantic, relaxed and intimate wedding. We had 28 guests consisting of our closest family and friends, so we occupied all three cottages and some of the local guest houses in the area. Each of the cottages were fantastic and as the weather was so good to us, with the sun shining all day, we were able to make use of the amazing grounds. 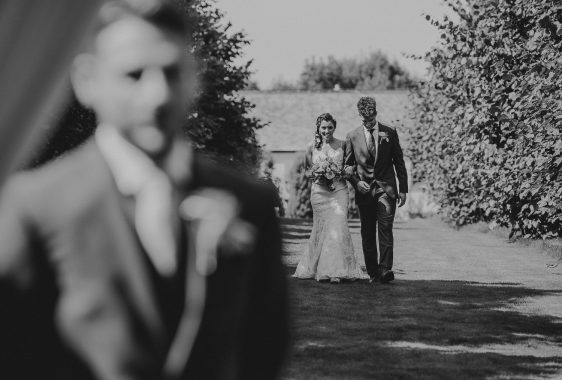 Getting married outside and also holding our drinks reception in the gorgeous gardens and our wedding breakfast and evening reception on the terrace of our cottage – the Linhay. The venue far exceeded our expectations, and Louise and Andy were the most fabulous hosts with the support of Hazel Parsons (our amazing wedding planner) they ensured our day ran like a dream. It really was the best day ever and Cosawes Barton captured the vibe we were looking for as well as our hearts – we’re so excited to return to celebrate our anniversaries in the years to come. THANK YOU LOUISE AND ANDY you are very lucky to have such a beautiful home, and we’re grateful you’ve chosen to share it!